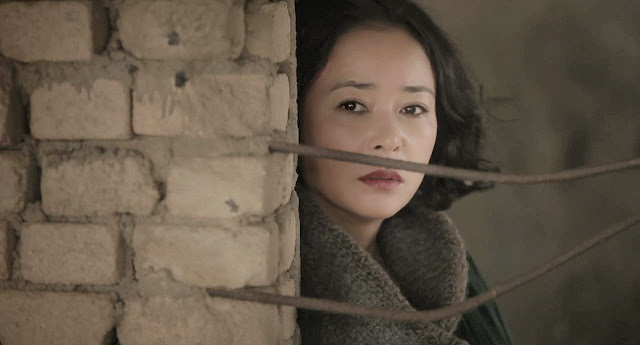 Modern Korean Cinema: Review: Pieta - What Does It Matter as Long as a Boy Loves His Mother? Kim brings a restrained style to this brutal tale, creating a claustrophobic feeling by alternating between tightly framed characters, shot from slightly above or below, and mobile handheld shots that sway queasily from side to side. Occasional moments of fast cutting rupture the cold, exacting mood, suggesting the deluge of emotional anguish to come. The lead actors’ performances are excellent; they seem to thrive under the clinical conditions which Kim creates. As Kang-do, Lee Jung-jin’s facial expression seems perpetually twisted into the contemptuous sneer of a man who can smell something foul, while Jo Min-su brings a quiet, harried beauty to her performance as the mother. Other characters pale into insignificance, the film is essentially held together by the two central characters. Their bizarre relationship reaches an apex with a parodic celebration of Kang-do’s birthday; a scene that creates a thick, palpable tension. In another particularly striking sequence, one of Kang-do’s elderly victims looks down from a fire escape at the huts and machine shops that comprise the neighbourhood below. He muses, half to himself, half to Kang-do, that soon this area will be transformed, the rickety shacks replaced by modern high-rise buildings. Suddenly, the film erupts into a brief but arresting montage of whirring, hammering, sparking machinery that would make Eisenstein swell with pride. Thematically though, the film suffers. On the one hand, based on sequences like the one outlined above, it seems as though Kim is mounting a critique on the rapid modernization of Korea, by documenting the unfortunate people left sidelined by smart cities and massive urban renewal projects. On the other, there’s the febrile oedipal consummation, the unleashing of aberrant and irrational sexual urges within a mother/son relationship. Much like Lars von Trier’s Antichrist (2009), with its story of a grieving married couple and supernatural horror trappings, the two parts of the film never seem to quite come together. Or is Pieta the film that does for maternal relations what Takashi Miike’s Audition (1999) does for marriage? At points, it seems as though Kim’s ambition is to have Slavoj Žižek deconstruct his work. Controversy apart, Pieta is a brilliantly made but thematically unsatisfying film. While other revenge-laden Korean shock-fests can feel like genre exercises, those attuned to the trajectory of Kim’s career, especially his autoportrait Arirang (2011), will detect a genuine – if somewhat narcissistic - howl of anguish. This howl is muffled by the coiled, tensile atmosphere Kim creates through his control over each and every scene. While a flawed film and uncomfortable viewing, Pieta has an undeniable power that would actually be increased if Kim restrained the tendency towards horrific violence and sexual transgression. More importantly, it offers a glimpse into a shameful world of poverty industry leeches and their helpless prey, a world half-submerged in the rapid onrush of hallyu.